I first met Ryan when we were just 13 years old. He was an incredible athlete, a top student, and a great friend. Over a decade later, while these descriptors still apply, he’s added a whole new set to this list. He’s an amazing visionary, a creative, and a storyteller. Through his YouTube channel The Path Less Traveled he showcases his exploration of some of the most untouched and unreachable places in New Zealand and around the world. And he only picked up a camera when he was 24 years old. This is someone who constantly challenges his own assumptions and pushes himself out of his comfort zone. From his first big backpacking trip to Southeast Asia when he was 23, to his plan to paraglide off the top of Kilimanjaro next year, Ryan Wilkes’ journey to explore farther and to share the stories of untouched places and unique people around the world is sure to inspire your own exploration and creativity. When you watch Ryan’s videos or look at his photography (featured throughout this article) it’s hard to believe this is someone who wasn’t born with a camera in hand. But Ryan used to live a very different life entirely unrelated to film. Working as an engineer in Canada, it was a trip to Southeast Asia at the age of 23 that really acted as the catalyst for him to move across the world to New Zealand and, ultimately, for his whole life to change. Pursuing his PhD in biomedical engineering at the University of Canterbury, not only did he move to somewhere he didn’t know anyone, he also started to search for something different while he was there. “People go to the same spots all the time and there’s the classic bucket list for New Zealand – you know all the ‘gram spots. But the crazy thing about New Zealand is that it’s such a small country, and the more you explore, the more you realize that you’ve seen none of it. There’s so many places where you can literally go off the path and end up on a totally different peak and a totally different environment. I really quickly was like, this is awesome, we need to keep going to these places that a lot of people haven’t been. So one of the first trips [my partner] Jillian and I did when we came to New Zealand was a road trip down to this place called Stewart Island which is kind of like New Zealand’s third island. It’s just south of the southern tip of the South Island, so really far down there and there’s only 300 inhabitants in this really small town and the rest is just Jurassic park style amazing forests and landscapes. I looked at the map and I was like what is down there? So we went down and had such a good time. This desire to see new places and to share it with the world sparked another passion: for videography. “It all kind of happened at once. I had a GoPro, that’s all I came to New Zealand with. I started to make these little videos to show my parents and then one thing led to another and now it’s almost 3 years later and my life revolves around filmmaking. But [my Youtube channel] The Path Less Traveled kind of evolved at the same time because I really want to take people to these unique places and show them where they can have these unique experiences that they’re not going to find in a Lonely Planet book. That along with the metaphorical meaning of the path less traveled, which is literally doing what you want to do with your life, being true to yourself and just not following the herd. Want to take travel Photos like These? 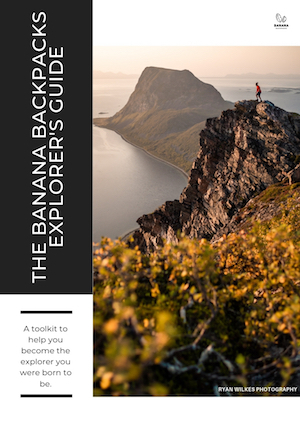 Download the Banana Backpacks Explorer’s Guide featuring Ryan’s tips for taking amazing travel photos. How do you find the path less traveled? As more of us want to get on our own path less traveled, it can be hard to know where to start. In the case of this PhD student, he uses some serious research work to find his own path. “It’s a mix of things. There’s a few places that I’ve been to in New Zealand that I’ve literally seen one photo of and sometimes I’ll hit the person up and see if I can find who took the photo and get in touch with them and sometimes they’ll tell me the general area. And then it’s onto Google Earth to try to find where exactly it is. Is there a trail there? Are you allowed to go there? Is it on someone’s private property? Which has definitely happened before – which is never good! And also just asking the locals is by far the best thing you can do. I’ve heard some crazy stories about some backpackers here meeting locals at a bar and 3 hours later they’re in this random glow worm cave that nobody’s ever heard of before. And having these surreal experiences just because they decided to chat with the locals. Sometimes this open attitude has landed Ryan in amazing situations, other times, shall we say, interesting ones. Putting himself out there, by talking to locals and getting off the beaten path, has led him to find some of New Zealand’s most beautiful places. This adventuring around New Zealand has inspired a desire to showcase remote experiences and unique places outside of New Zealand as well. Which is why next up on Ryan’s list is a pretty once-in-a-lifetime kind of adventure, and better yet, vehicle to make a social impact. “We are planning next September to go to Tanzania with a group called Wings of Kilimanjaro. It is a pretty exclusive group of people who end up going most of the time and it’s because it’s quite a resource intensive operation, in both time and money. It’s not necessarily because it costs a lot of money to go but they challenge the participants to fundraise a lot of money and 100% of the fundraised money goes towards local projects in Moshi, which is the town at the base of Kilimanjaro which services everyone who goes up and down the mountain. It’s kind of the hub for Kili. So all of the money so far since 2013, I think they’ve raised over 700 000 dollars, and that’s gone towards building a really nice school, many water projects, and also educating farmers about best practices and also helping them out with buying trees and planting trees and stuff like that. So this year they hope to push it to over a million dollars raised. Kilimanjaro is not a technical climb at all, you have to be fit but there’s no rock climbing, there’s not even really any scrambling, it’s a steady gradient. But 20% of the people who start the climb don’t make it up because of altitude sickness and you take a while to acclimatize. So it takes 4 or 5 days to get to the summit and then we have an extra 2 or 3 days on the summit just to make sure that we have the best chance at flying off because paragliding is so reliant on the wind, the weather. There’s no guarantee that you’re going to fly off. So in previous years no one has flown at times because the weather hasn’t cooperated for 3 days straight and they couldn’t get off. And that’s why I’m saying it’s more about the whole journey of getting there and seeing the impact on the community and paragliding is just like the cherry on top. It’s kind of like the vehicle for the impact that we’re hopefully going to be making, but most of the chat when we’re there is around how awesome the locals are, and about Tanzania and the community and probably knowing me and my friends, like wow what can we do here, what kind of project can we set up to help these people. The chat won’t be about paragliding, you know? As Ryan continues to explore and share his adventures with the world, he wants to do more than just show beautiful images. He wants to connect people to the stories out there. “People are starting to kind of crave more […] I think people love stories. People are drawn to good stories because we all want this emotional connection. I think we live in this really connected [world] with our phones, with the internet – everything – we’re ultra-connected. But at the same time we’re disconnected in a way. I think people are looking for content that is relatable and emotional at the same time. So storytelling and the ability to tell a compelling story in a concise way, in a compelling way, is going to become more and more important. As it is for most worthwhile things, when we help others, we are inevitably changed ourselves along the journey. This is no different for Ryan through his off-the-beaten-path adventures and sharing what he explores with others. “It’s just been this crazy domino effect. It’s not being afraid to leave behind things that aren’t certain to you anymore. I think that’s a big thing that a lot of people have trouble with. Most people, as humans, we like being comfortable. That’s kind of a built-in mechanism that we have but once you step outside of that and once you take a chance and it pays off, it opens your eyes to so many different opportunities. I never thought in a million years people would pay me to do something that I just genuinely really, really, really love. And now that I know it’s possible, it’s just this feeling of endless possibilities. It’s hard. Anything worth doing, the learning curve is going to be super steep. You have to be like, okay, I’m going to commit a solid 6 months to see if I enjoy this because as you know, when you take on something new, whether it’s starting a business or starting a new hobby or whatever it is, man there’s going to be some serious growing pains and there’s going to be times where you’re probably not going to want to do it, but it’s those times where you just put your head down and keep going that you’ll look back on in 2 years and be like, thank god I gave it a go. If you’ve ever questioned your own ability to take The Path Less Traveled, Ryan serves as an incredible example that no matter what stage of your life you’re at, it’s never too late to change the way that others define you and, more importantly, the way you define yourself. You can follow along with Ryan’s amazing videos and photography on The Path Less Traveled YouTube channel, Instagram, and Facebook page.